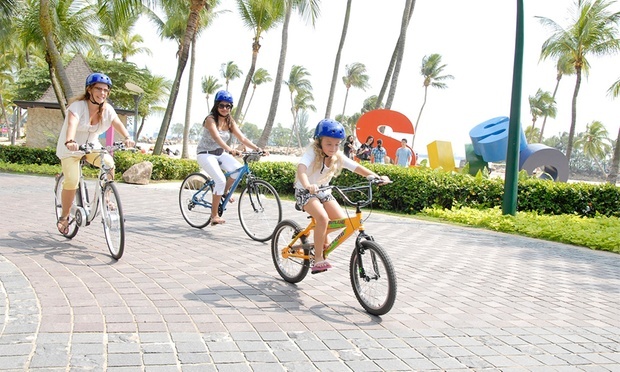 Enjoy hours of leisure cycling around Sentosa at your own pace! Pedal through the greenery of Sentosa on dedicated bicycle tracks and discover new sights which you have never seen before. For a more adventurous cycling experience, grab a Sentosa map and embark on the hidden trails on the island. Please remember to bring your sunscreen, it was really hot that day. But I was glad that my family can I can get some exercise in. And besides, the view was fantastic! Its nice to see an attraction that promotes going green. It's really cooling to be cycling around Sentosa! Very convenient to be travelling on the bike around the island. Paddling around Sentosa is pretty cool! Had so much fun cycling with my kids. Very windy and a lot of nice scenery as well. Bike rentals are available at the Segway® Eco Adventure ticketing Counter @ Beach Station (besides Gelatissimo), and at Segway Eco Adventure @ Siloso Beach (after Luge, opposite Bikini Bar). *Please note Tandem bicycles and Adult with child seat bicycles are not available.